Gibbs High’s Tyler Mullins and Powell’s Jack Richards wait to battle for a rebound in a District 3-AAA game won by the Panthers, 66-45, Tuesday night at Jeff Hunter Gymnasium. Despite trailing at halftime, the Powell High School boys basketball team didn’t press the panic button Tuesday night. “Gibbs came out and shot the ball well in the first half and I told our guys to just keep doing what we were doing in the first half,” Panthers coach Gary Barnes said after Powell exploded in the second half en route to 66-45 District 3-AAA victory over the Eagles Tuesday night at Jeff Hunter Gymnasium. Powell (13-6 overall, 7-3 in the district) was able to use its depth to wear down Gibbs (10-11, 3-7). The Panthers utilized a 10-man rotation and thus were able to keep their players fresh. The Panthers also got a huge third-quarter offensive boost from junior Quinton Fields. He was held scoreless in the first half but he scored Powell’s final 10 points of the third quarter and helped his team open a 48-31 by the end of the third frame. The Eagles had a 25-24 lead at halftime before the Panthers used a 24-6 run to put the game out of reach. In addition, Powell clamped down on defense as Gibbs made just six of its 24 field goal attempts after halftime. The second-half collapse has become all too common for the Eagles. “It has kind of been the story for us in the second half,” Gibbs coach Timmy Meade said. “We play good for a couple of quarters, and then have an off quarter. Powell center Conley Hamilton scored 12 points and grabbed eight rebounds. 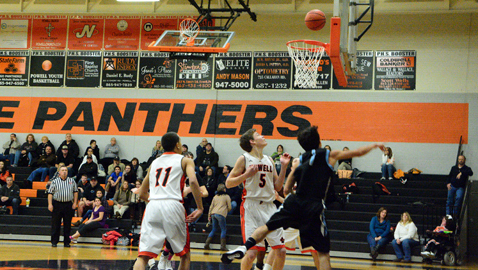 Guard Charlie Richards had 10 points while Matthew Samples and Brandon Brown scored seven points for the Panthers. Chris Bradford scored 12 points to lead Gibbs, which has lost five consecutive games.